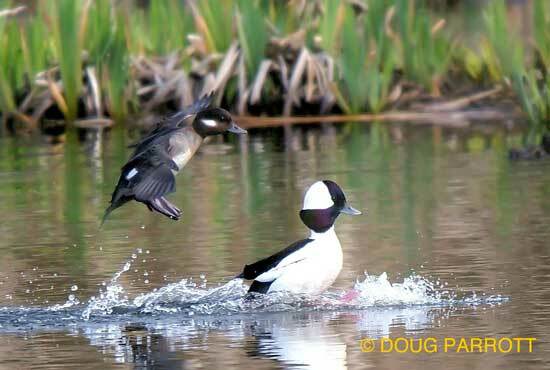 Female Bufflehead (left) pursues a likely male. Mother Nature probably programmed Buffleheads to forget the pangs of duckling-rearing. That’s my husband’s theory, anyway. Of course, he thinks women quickly forget childbirth too, so there you go. To attract a new mate, each male Bufflehead flies near a rival, spreads out his ruby-red feet, and splashes down, puffing out his chest and giving the biggest quack he was capable of. Unfortunately, since Buffleheads are among our tiniest of ducks, his roar comes out sounding more like a rubber-ducky squeak. Macho Man. The rival squeaks in return, and then they both look around to see how impressed the females are. Very impressed, if the females’ admiring looks are anything to go by. As for me, I was doubled over on the shore, laughing. Winter in Seattle is just around the corner, with perpetual gray skies, sleet alternating with cold rain, and daylight hours restricted to the ones you spend indoors, hunched over your computer in your work cubicle. Ancient peoples of the Northern Hemisphere, faced with similar conditions, would sacrifice their first-born, hoping the gods would relent and make summer return. Luckily, we more modern types don’t have to go to these extremes. All we have to do is walk down to Yesler Cove and watch the Buffleheads for awhile. They know spring will come again soon, and they plan to be ready. This entry was posted in Uncategorized on November 27, 2012 by constancesidles.